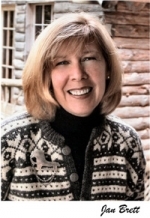 Jan Brett (born December 1, 1949) is a best-selling American author/illustrator of children’s books. Her books are known for colorful, detailed depictions of a wide variety of animals and human cultures ranging from Scandinavia to Africa. Her best-known titles include The Hat, The Mitten, The Three Snow Bears and Gingerbread Baby. In northern Canada a rabbit named Little Snow is celebrating his first Christmas, and after all the forest animals tell him about the animals’ Santa, he is excited to wake up on Christmas morning to find his own surprise. When her cat Taffy disappears, Annie tries to attract a new pet by putting corn cakes at the edge of the wood. None of the animals who come to eat the corn cakes are suitable for a pet -- then Taffy returns, with a surprise. Young Bo the armadillo follows his new friend to the rodeo and has a wonderful time -- until Ma comes to bring him home. Beauty accompanies her father to the Beast’s palace to take her father’s place and finds that her place is with the Beast. The Bear Band is on their way to play in the Village Square for the gala ball when the band wagon gets stuck in a rut. Who can get them out? Here are some favorite stories about Brer Rabbit to color. Seven favorites from Jan Brett in one volume. When two trolls make off with Treva’s family Christmas pudding, she knows something has to be done. Hedgie the hedgehog makes his first appearance. Jan Brett brings us a magical chicken Cinderella. Comet, a Nantucket cat starts looking for a home as his nine lives slip away. A flood takes Daisy away in her basket down the river, but Mei Mei finds her at the market and takes her home again. Hoppi the bunny is planning how to decorate his Easter Egg when he is sidetracked by something more important. In this Polish fairy tale, the miller’s youngest daughter saves her sisters from an evil magician. Kip the cave boy tames a paleo wolf and names him Dog. This is an anthology of poetry, song and rhymes with illustrations by noted children’s illustrators. Fritz was not a beautiful horse. He was a sure-footed pony, kind and dependable and good with children. He finally gets his chance to prove himself. In Jan Brett’s telling, the Gingerbread Baby finds a home -- and not in the fox’s stomach! The Gingerbread Baby wants some friends to play with him when Mattie is busy. What better place to look for friends than a bakery? The Three Bears neglect to lock their door and return to find their porridge eaten, chair broken and -- what’s this in wee, small bear’s bed? It must be that notorious burglar -- Goldilocks!